This is the main instrument panel for Bayliner Model 2452. Beautifully laser engraved into .125" Matte Black Aluminum / Acrylic panel. This gives an overall thickness comparable to a factory set for replacement purposes. Engraving reveals bright white lettering and provides a much more wear resistant method of labeling switches and instrumentation. Also available in Clear / Black to facilitate backlighting. Please specify at check-out. 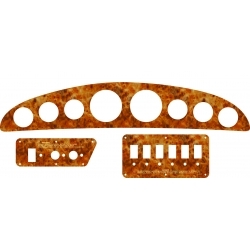 Design drawings based on an original set of OEM panels so all factory mounting points will align. All are based on an original factory set, but can be rearranged in any way you wish at no extra charge. See examples for various layouts that have been provided in the past. 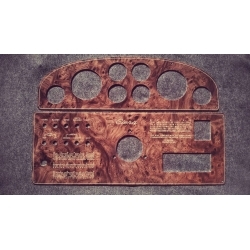 This beautiful dash panel is based around an OEM 1980 CHB Sedan Trawler. 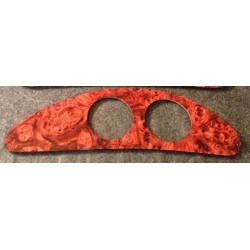 This panel fits both upper and lower helms and is constructed from a .080" aluminum backing panel that is vacuum press laminated to a .060" 2-ply digital burlwood. The laminated panels are then CNC (Computer Numerically Controlled) milled on a large format high speed computer controlled router. All of the openings, cutouts and outsides are precision cut on the mill. The panel blanks are then transferred to our CNC controlled CO2 laser for engraving. This process provides an incredibly accurate and clean dash panel. Easy to clean, durable and customizable. Contact us via email to build one at the same price for your trawler. 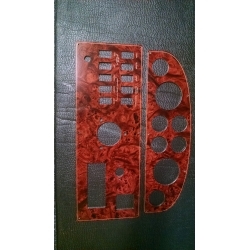 This beautiful dash panel is a re-lamination based of a customer provided set of OEM panels off of a 1987 4550. If the existing panels are straight and relatively intact, we can re-laminate the old and then laser engrave them. All of the openings, cutouts and outsides are left from the original panel. The panel blanks are then transferred to our CNC controlled CO2 laser for engraving. This process provides a method of refreshing an old dash set and saving a few bucks in the process. The laser engraving is much more durable than the silk screened labels that wear away over time. 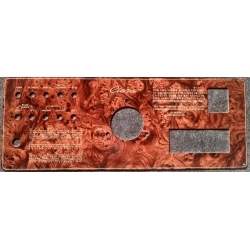 These labels are engraved into the panel itself and provide bright gold lettering against the rich burl wood background. Easy to clean, durable and customizable. This beautiful dash panel is based around an OEM Bayliner 2455 Sunbridge. The same panel will fit all year models from 2000-2003. 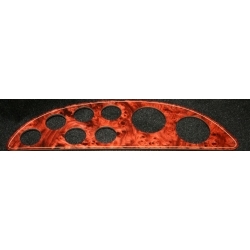 This panel is based on a .080" aluminum backing panel that is vacuum press laminated to a .060" 2-ply digital burlwood. The laminated panel is then CNC (Computer Numerically Controlled) milled on a large format high speed computer controlled router. All of the openings, cutouts and outsides are precision cut on the mill. The panel blanks are then transferred to our CNC controlled CO2 laser for engraving. This process provides an incredibly accurate and clean dash panel. The laser engraving is much more durable than the silk screened labels that wear away over time. These labels are engraved into the panel itself and provide bright gold lettering against the rich burl wood background. Easy to clean, durable and customizable. Does not include optional filler panel. This beautiful dash panel is based around a customer supplied drawing set for a 1994 Bayliner 3055 Sunbridge. 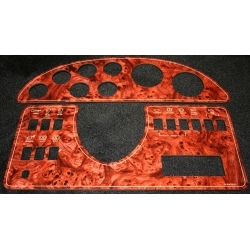 This set of panels is based on a .080" aluminum backing panel that is vacuum press laminated to a .060" 2-ply digital burlwood. The laminated panels are then CNC (Computer Numerically Controlled) milled on a large format high speed computer controlled router. All of the openings, cutouts and outsides are precision cut on the mill. The panel blanks are then transferred to our CNC controlled CO2 laser for engraving. This beautiful dash panel is based around an OEM 1992 Chaparral Sunesta Sunbridge Cruiser. This was a custom layout, but can be modified to OEM configuration at no additional cost. This set of panels is based on a .080" aluminum backing panel that is vacuum press laminated to a .060" 2-ply digital burlwood. The laminated panels are then CNC (Computer Numerically Controlled) milled on a large format high speed computer controlled router. All of the openings, cutouts and outsides are precision cut on the mill. The panel blanks are then transferred to our CNC controlled CO2 laser for engraving. This beautiful dash panel is based around an OEM Bayliner 2x55 Sunbridge. Should fit most years from 1993-2002. Customer upgraded existing switches to Carling Cordura Style Rocker Switches. There was also some custom labeling done at no additional charge. really a nice looking panel set. This is the main instrument panel. Beautifully laser engraved into .125" Matte Black Aluminum / Acrylic panel. This gives an overall thickness comparable to a factory set for replacement purposes. 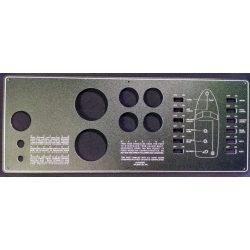 Engraving reveals bright white lettering and provides a much more wear resistant method of labeling switches and instrumentation. Also available in Clear / Black to facilitate backlighting. Please specify at check-out. All are based on an original factory set, but can be rearranged in any way you wish at no extra charge. 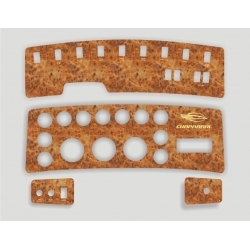 This beautiful dash panel is based around an OEM Bayliner 3055 Sunbridge. This set of panels is based on a .080" aluminum backing panel that is vacuum press laminated to a .060" 2-ply digital burlwood. The laminated panels are then CNC (Computer Numerically Controlled) milled on a large format high speed computer controlled router. All of the openings, cutouts and outsides are precision cut on the mill. The panel blanks are then transferred to our CNC controlled CO2 laser for engraving. 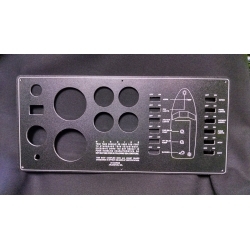 Dash Panel Set (4 Panels) for a 1996 Maxum 2400 SCR Sunbridge Express Cruiser. Beautifully laser engraved into .060" Burlwood Acrylic vacuum laminated onto customer provided panels aluminum panels. Labeled and dimensioned from customer provided original panels. Engraving reveals bright gold lettering and provides a much more wear resistant method of labeling switches and instrumentation. Customer original panels are necessary due to the stud mounted gauge clusters. New panels are considerably more expensive do to the metal work associated with mounting new studs. 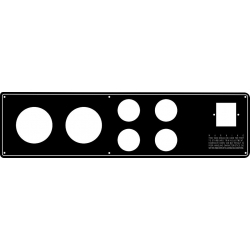 1998 Carver 430 Motor Yacht Dash Panel Set (3 pieces). Matte black with white laser engraved lettering. Full set modified to customer specifications. This beautiful dash panel is based around an OEM 1999 Chaparral Sunesta Sunbridge Cruiser. The same panel should fit other year models in the 1998-2000 year range. 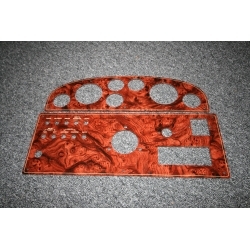 This set of panels is based on a .080" aluminum backing panel that is vacuum press laminated to a .060" 2-ply digital burlwood. The laminated panels are then CNC (Computer Numerically Controlled) milled on a large format high speed computer controlled router. All of the openings, cutouts and outsides are precision cut on the mill. The panel blanks are then transferred to our CNC controlled CO2 laser for engraving. This is the main instrument panel for Bayliner Model 2452. All are based on an original factory set, but can be rearranged in any way you wish at no extra charge. See examples for various layouts that have been provided in the past. This beautiful dash panel is based around an OEM 1999 Chaparral Sunesta Sunbridge Cruiser. The same panel should fit other year models in the 1998-2000 year range. 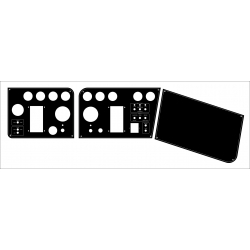 This set of panels is based on a .080" aluminum backing panel that is vacuum press laminated to a .060" 2-ply matte finish black face. The laminated panels are then CNC (Computer Numerically Controlled) milled on a large format high speed computer controlled router. All of the openings, cutouts and outsides are precision cut on the mill. The panel blanks are then transferred to our CNC controlled CO2 laser for engraving. 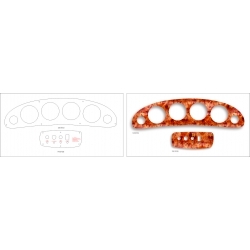 Design drawings based on an original set of OEM panels so all factory mounting points should align. This beautiful dash panel is based around an OEM Bayliner 2x55 Sunbridge. The same panel will fit all year models from 1993-2002. 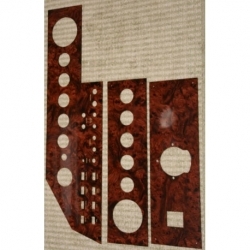 This set of panels is based on a .080" aluminum backing panel that is vacuum press laminated to a .060" 2-ply digital burlwood. The laminated panels are then CNC (Computer Numerically Controlled) milled on a large format high speed computer controlled router. All of the openings, cutouts and outsides are precision cut on the mill. The panel blanks are then transferred to our CNC controlled CO2 laser for engraving. 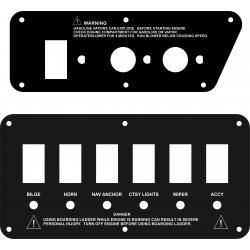 Dash panel was customized to fit customer provided toggle switches rather than OEM rockers. $50 discount for providing template panels. This beautiful dash panel is based around an OEM 1998 Chaparral Signature 30 Cruiser. 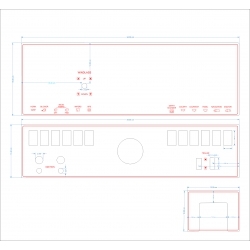 This is an OEM layout, but can be modified to other configurations at no additional cost. 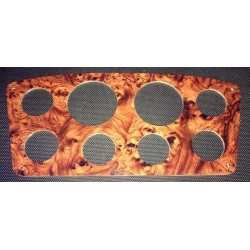 This set of panels is based on a .080" aluminum backing panel that is vacuum press laminated to a .060" 2-ply digital burlwood. The laminated panels are then CNC (Computer Numerically Controlled) milled on a large format high speed computer controlled router. All of the openings, cutouts and outsides are precision cut on the mill. The panel blanks are then transferred to our CNC controlled CO2 laser for engraving. This beautiful dash panel is based around an OEM Bayliner 2455 Sunbridge. The same panel will fit all year models from 2000-2003. This set of panels is based on a .080" aluminum backing panel that is vacuum press laminated to a .060" 2-ply digital burlwood. The laminated panels are then CNC (Computer Numerically Controlled) milled on a large format high speed computer controlled router. All of the openings, cutouts and outsides are precision cut on the mill. The panel blanks are then transferred to our CNC controlled CO2 laser for engraving.